Visit The Wild Woods This Summer! Got the secret desire to be an explorer? Envy Indiana Jones? Ever yearn for the excitement of bushwhacking through uncharted lands? Adventure is yours, right here in New Jersey. Discover over 305,000 acres of little known forests, meadows, streams, and lakes collectively called Wildlife Management Areas - all public property, all owned by the people of New Jersey. This land is your land! 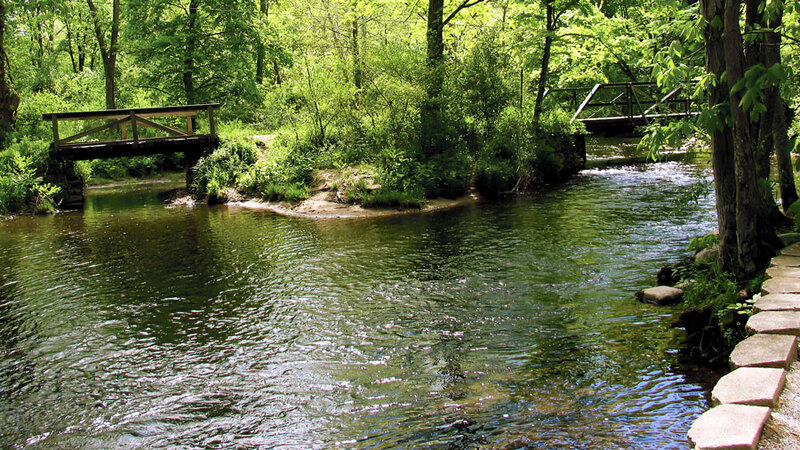 In Sussex County alone, 16,645 acres of unmarked trails for walking, hiking, mountain biking, and horseback riding; streams and lakes for canoeing or boating; hidden habitats for great birding; and rangy mountains comprise the wildest of New Jersey's lands. "The lands are open for everybody," says Robert Olsen, former regional superintendent Bureau of Land Management (BLM), Division of Fish and Wildlife, NJDEP. "It's a little bit more roughing it than at the parks." Miriam Dunne, former BLM northern regional planner adds, "The people who want to hike, bird watch, or cross-country ski, they don't worry about the amenities." 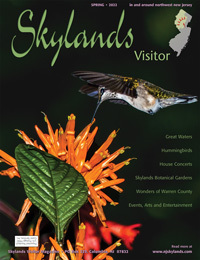 The BLM oversees Wildlife Management Areas (WMAs pronounced Wammas) throughout New Jersey. Before 1961, all lands were purchased with hunting and fishing revenues; since then, Green Acres bond money has become available and used to buy WMAs, which are then assigned to the Division of Fish and Wildlife. Of the 121 WMAs in the state, nine exist in Sussex County, Walpack being the first acquired in 1932 and Sparta Mountain the last in 1998. Just twenty employees in the BLM's northern region manage and maintain the northern WMAs. (Give 'em a hand!) Last year they were short on funds because of a decrease in hunting and fishing licenses, which historically provided most of the Division's maintenance funding. But fixed costs increased, so, for the first time ever, the Division of Fish and Wildlife received appropriations from the state. "This year we're counting on that again," says Dunn. "We've agreed to keep taking on properties," Olsen adds. "We keep getting more and more land. Green Acres is very aggressive in buying land whether the goal is us, or parks, or county, or municipal open space." The BLM works with outside organizations and inside departments to plan, enhance, and maintain habitat. For instance, the Division's Endangered and Nongame Species Program is studying the Golden-winged Warbler on the power line on Sparta Mountain. Meanwhile, the BLM capitalizes on the power line by cutting clearings in the adjacent forest to create more open habitat. "It's a good way to utilize open space because some species are area dependent," says Olsen. They mow WMA fields every few years to control invasives and to keep them in grassland habitat for birds, turkey, and rabbit. They also stock trout and pheasant on wild lands. "Diverse habitats mean diverse wildlife," says Olsen. Traditionally hunters and anglers used the WMAs, and today they may still know the woods best. But for adventurers, a sampling of WMAs and what to do there follows. The 2,090-acre Flatbrook-Roy WMA offers days worth of hiking, fishing, mountain biking, horseback riding, birding, and botanical exploration. And you can't get lost! From Route 206, take Rt. 560 at Tuttles Corner to Rt. 615 past Peters Valley and go straight (left fork) onto the dirt Mountain Road into the Three Bridges area. Cross over the Big Flat Brook on wooden bridges. On the left is the Blewitt Tract, part of the Delaware Water Gap National Recreation Area (DEWA). Turn right into a parking lot with a handicap-accessible fishing area. Park and take a mile walk on a woods road to the Roy Bridge. The Flat Brook and mature forest create great habitat for watching birds such as Baltimore orioles and yellow warblers. Drive up Mountain Road, or take it any way you wish ­ mountain bike, hike, or horseback ride (with a permit, obtainable from the Asssunpink WMA.) Driving on, pass a small parking area, then take the second dirt road on the left, Struble Road. Take a walk up Struble or put your 4-wheel drive into action. Here, the BLM consorts with the Ruffed Grouse Society in the Ruffed Grouse-Woodcock Habitat Improvement Project, conceived in 1995. Up the rutted dirt road, you'll eventually spot overgrown fields on the left with a small place to park ­ another perfect spot for birders. Bright green mounds of American beech seedlings crowd this three-year-old clearcut, along with other native tree and shrub species. The Society planted fir saplings to jump start the process and to provide instant cover. "People will probably look at this and say that the forest has been destroyed, but there is such a high stem density in here," says Dunne, explaining that this is exactly what certain bird species, like grouse and Blue-winged Warblers, prefer. The beech mounds heap across the hillside - perfect escape cover for birds. Foresters left a few mature white pines for cover in deep snow. Red maple and birch seedlings grow. There is no deer browse here. "This is a success. You're regenerating trees, not multiflora and autumn olive," says Dunne. Head over to an adjacent eight-year-old cut overlooking the Delaware River Valley. "A lot of species breed in a different area than they utilize," says Olsen. "That's why diversity is so good to have and why we grow different-aged areas so close together." The BLM's plan here is to improve habitat for grouse, woodcock, and other species that prefer scrub-shrub woodland. Under the plan, Forestry contacted independent foresters to clearcut four separate land parcels totaling 100 acres, one every five years, and to sell the lumber to recoup part of the cost. Most of the state's forests are 80 to 100 years old. "They're not diverse. We need more early successional growth," says Dunne. "We want to try and recreate a mosaic in the forest." The BLM puts their plans out for internal review within all natural resources agencies including Natural Heritage for rare and endangered species and historic and cultural artifacts, forestry, and forest fire. "We are taking advantage of all experts within the department so we're making sound decisions," she adds. "We don't just come up here and start taking trees down," adds Olsen. "We're not maintaining an opening. We're letting it succeed. We're after biodiversity - that's what the goal is." Russell Spinks, local Layton resident, raised a family on the Flatbrook WMA while he was senior wildlife biologist, in charge of the northern WMAs for close to forty years. His family hunted, fished, trapped the woods, and fished the freshwater streams and marshes. At work he planted conifers, shrubs, and food patches with different kinds of grain. He bulldozed brushy fields and put in millet, sorghum, corn and clover to create a lot of edge for wildlife ­ mostly birds, rabbit, grouse, and turkey, after it was reintroduced in 1976. He made two migratory waterfowl impoundments ­ one in Hainesville and one in the Roy section for feeding, resting, and nesting. Birds abounded ­ teal, mallards, wood and black ducks. His crew planted conifers as escape cover for deer, rabbit, and grouse. The state bought the Flatbrook land from the Flatbrook Valley Club in 1944, says Spinks, who saw President Hoover fish there. Even then, streams were trout-stocked with fish from the club's own hatchery. He took Brendon Byrne and Tom Kean and their children trout fishing at the private Overlook Club in Flatbrookville. "There were a lot of hunting and fishing clubs in the valley. The government bought the land and old-timers died off. There are only a few left." Meanwhile, his own kids gained a closeness to the land and an appreciation for plants and animals. If you enjoy birding, hurry to the recently acquired Paulinskill Hyper-Humus WMA in Lafayette. Take the dirt road at the Paulinskill WMA sign on Route 94. Drive past the deserted house and over the Paulinskill Valley Trail (PVT) to the parking lot and get ready for an interesting and easy two-mile loop walk. Go around the gate down the dirt road, a levee between the West Branch of the Paulins Kill (river) on the left and three shallow impoundments on the right. See lots of swallows and swans, and maybe catch a glimpse of an American or Least Bittern along the ditches. The BLM and Army Corp of Engineers are designing a management plan for the site. The plan right now is to cut openings in the dike next to the Paulins Kill so river water fills the impoundments while bringing in seed to naturally re-vegetate the area. As sediments naturally fill the shallow lake and plant material seeps in, a wet forest - or swamp - will one day evolve, they hope, and will help control phragmites. "The Army Corp wants to get back to a more natural habitat, the way it was before. We'd like to maintain the ponds for waterfowl," says Olsen, who would like to see the first two impoundments remain open for bass fishing and birding. "These are all ideas I have. We have to get others like Ducks Unlimited involved." "We'll develop a management plan that takes into account past usage, diversity with open water and diversity in the woods, recreation uses ­ hunting, fishing, wildlife watching, access needs such as parking areas, any facility and road improvements, structure issues that hold water, and work with the Army Corp," says Dunne. Tall order. In keeping with the BLM's number one priority to protect wildlife habitat and unique ecosystems, a consultant hired by the Office of Natural Lands Management, Division of Parks and Forestry, is conducting a nine-month inventory of all onsite flora and fauna. The results will help determine how to manage the property by knowing which species exist. Secondly, the BLM maintains WMAs for recreational access, legal hunting and fishing, birdwatching, canoeing, kayaking, and non-motorized sports. Anyone can bring a canoe into the Paulins Kill or the ponds in the Paulinskill WMA. In general, "wherever you can put a boat it's perfectly legitimate to do so," Dunne adds. 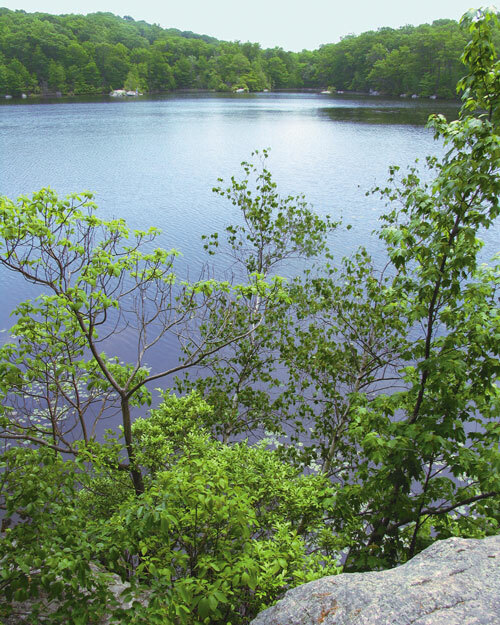 In Sussex County, only two WMA lakes allow electric motors up to 10 HP ­ Rikers Lake on Sparta Mountain and Silver Lake on Hamburg Mountain. Local lore has it that William Penn once owned this land. "Someone came in the mid-1800s, made a ditch to drain the land and make it productive," says Jim Zamos, local resident and former manager of Pequest Fish Hatchery in Warren County. In the 1900s, the Hyper Humus company started mining dirt and eventually sold it to Scotts lawncare products. The impoundments were smaller ponds with dikes in between, long sunk in the ground. There was also a narrow gauge railroad that ran on the levee, hauling out humus. Birders have spotted kingbirds, warblers, Virginia rails, snipe and spotted sandpiper. Turn left when you reach the shoreline and can't go anymore, then walk over a wooden bridge into the woods. 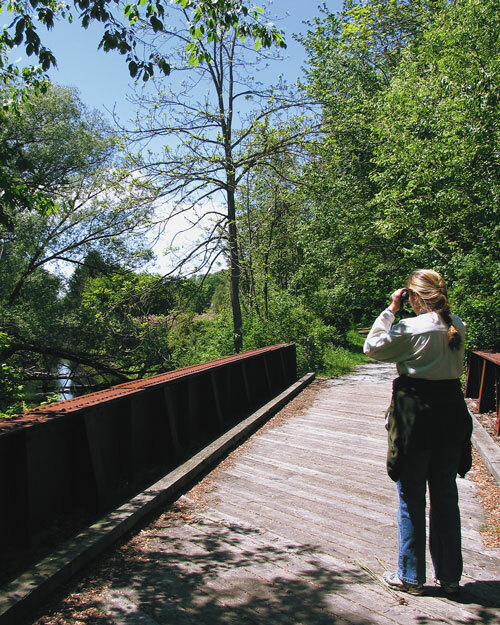 Turn left onto the Sussex Branch Trail for a quiet walk with nothing but the sounds of rustling leaves and birds. Turn left on the road for a short distance to the PVT parking lot. Turn left onto the trail, then left soon on the dirt road back to your car. Way over at Hamburg Mountain Wildlife Recreation Area in the Highlands, a plethora of fun awaits the explorer. Take Silver Grove Road off Rt.23 in Stockholm to Silver Lake Road to Silver Lake, a not-so-hidden gem. This popular spot offers fishing, canoeing, birding, and fun hiking on a maze of unmarked woods roads and footpaths. Along the lake's edge, look for bass cruising the shallows, water snakes, frogs, and the flashing fins of bluegills while listening to birdsong. Families picnic on rock ledges and concrete ruins around the lake. Boulders dot the shoreline and jut from the lake forming small islands. Have lunch on your own private island ­ just take your garbage home with you. Check out the interesting swamp across the road from the parking lot, surreal in appearance, with good-sized trees downed by beaver, and water that comes almost level with the road. Barred Owl, Red-shouldered Hawk, Northern Goshawk, Red-winged Blackbird and lots of bears live here ­ in fact, all over Hamburg Mountain. On top of the mountain, small man-made ponds dot the land. "Some were made legally and some just appeared," says a local gentleman. Mountain Creek uses some for snow-making. On a ride up Route 515 to the top, Newark Watershed property is on the right and WMA is on the left. Turn left at the wooden sign and ride the rutted gravel road at your own risk down to the first pond, which seems forever to get to. It is truly isolated and unclear beyond that what is private and not. Bring a jack, a spare, and a whistle. For a quick hike on Hamburg Mountain, park in the Fish and Wildlife lot south of Route 517 on the northbound side of Route 23. On the right, a wide trail leads uphill. It soon becomes a narrow footpath trudging upward through a ghostly swath of dead hemlock whose gnarly branches lean over the path. Trails are not marked here, for the area is used mostly by hunters and local hikers who know the woods. But it's easy to find your way if you stop and look around at every change of trail. Take note of big trees or those that grow in an unusual way so you know where to turn when you return. Bear left at the first skinny fork. The right one goes to private property ­ notice the configuration of the trail here. This main trail is wider as it slides under chestnut and every color oak, hemlock, red maple, and hickory. Soon turn left onto a path that switchbacks downhill to a stream. Find your best way to cross the stream on rocks. There is no trail here, but walk straight ahead to a trail and turn right, heading uphill again. Turn around here and notice everything you see so you know where to turn. Is there a 30-foot hemlock on the left side of the path? Do the prostrate fallen boles of trees point to the way home? The woods road runs above the stream, through hemlock, ferns, an American beech forest from seedlings to trees over two-feet in diameter. Ignore the first trail coming in from the right. The path follows a ridge above a swamp, becoming wet until at the top it reaches a massive rock formation splitting into giant blocks with ferns growing in the cracks. Go back the way you came. Always stay right until you reach the spot where you crossed the stream ­ it will be at stream level. Across the stream, the path goes uphill. At the fork go right and head down to the parking lot. During hunting season wear blaze orange so that people can see you if you get lost. There is no hunting on Sundays. Beyond Thoreau and Leopold, there are those who advocate for wildness. One such person is Sig Borstad, owner of the archery shop in McAfee. "As far as I'm concerned," he says, "these wild lands get too much use and they're not wild anymore. The heaviest use of the mountain (Hamburg) right now is by deer hunters and turkey hunters. As for people walking around up there, it's people leaving garbage. The less garbage, the better it is for wildlife. That mountain has been abused many, many times over the years. As far as I'm concerned, people can leave it alone. A lot of bears live there. Leave it alone. Leave it as wild land." The BLM hopes to arrive at the answers by developing more comprehensive management plans by involving other DEP agencies and also local communities. "We're going to get everybody's opinions on what to do," says Olsen. "We're not going to please everybody, but we want to utilize properties as best as possible for wildlife and human use as well. Even though hunters' and anglers' funds pay for management of the WMAs, they're open to the public. You don't have to have a hunting or fishing license to go on the property. Everybody is welcome to come out and enjoy the outdoors in the WMAs. I just enjoy seeing the wildlife." Use it, don't abuse it. Take your garbage home.